Dustin and Bethany Dressed in Many Layers Before Our 5K! It was cold. It was windy. It was hilly. And it required me to run more than twice the distance I’ve ever attempted to run before. It was also one of the best experiences I’ve shared with my wife lately. 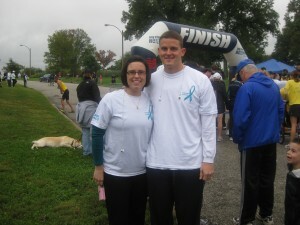 I recently completed my first 5K run in support of Ovarian Cancer Awareness. Running in memory of a close family friend who recently lost her battle with this under-recognized disease provided plenty of motivation to tackle a hilly course in pretty nasty weather conditions for my first 3.1 mile run. And being surrounded by friends took a bit of the chill out of the air. However, what made this day particularly special was sharing it with my wife. While it was her first race since giving birth to our third child 10 weeks earlier, she really enjoys running and has completed numerous 5K events over the past few years. 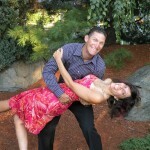 How to Run a 5K Race with Your Spouse…and Actually Enjoy It! While 3.1 miles is a warm-up for some people, it’s a real challenge if you’ve never run that far and/or you just had a baby. In order to prepare for the event, my wife and I simply spent some time running for a couple weeks leading up to the race. 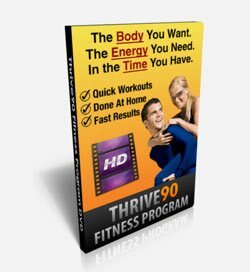 I had a great base level of fitness from my ongoing use of the Thrive90 at-home workout system, but I needed to put some miles on my legs and get rid of the associated soreness. My wife needed a chance to ease back into working out postpartum. And so we ran. With three kids at home, we rarely (if ever) get to run together, so we simply took turns caring for the kids while the other one got in a 30-minute run or walk. When weather permitted, we took brisk walks with our children in tow. FREE TRAINING PLAN – If you’re interested in training for your own 5K event, don’t miss our free 5K training plan! We talked to each other before the 5K and agreed in no uncertain terms that we would not be racing. At least we wouldn’t race each other because we knew nothing good would come out of that under the circumstances. This rule prevented us from resenting each other during the race, and it really improved the level of support that we provided one another. It helped us run as partners and not opponents. Now, if you and your spouse are both strong runners and you both agree you’d enjoy some friendly competition, then feel free to race. However, I’d encourage you to establish the ground rules ahead of time. And don’t talk too much trash! In addition to not competing, we agreed upfront that there would be no expectation that we run the entire race together. We each brought our own iPod and ran at our own pace. This turned out to be very important as I ran at a slightly faster pace, and it would have been uncomfortable for me to slow down and wait for my wife when it’s not my natural speed. I turned and smiled when I could, and we exchanged looks of true support and enthusiasm throughout the event. After crossing the finish line, we met with a giant sweaty hug and a lot of pride. She was proud that I could actually run 5 kilometers without the need for her to cash in my life insurance. And I was amazed by her abilities to persevere for 3.1 hilly miles so soon after giving birth. It was an awesome day that we’ll remember and cherish for a long time. And guess who is planning to join his wife for her next 5K? Yep, I have a new Personal Record to break! Have you ever completed a 5K race or similar event with your spouse? Did you enjoy it? One of the happiest moments of my life was crossing the finish line my boyfriend. We endured the challenge together and succeeded together! That’s awesome, Lisa! Were you running a 5K or something even longer? It’s certainly a bonding experience, and accomplishing something athletic together creates very lasting memories. My fiancee and I ran a 5K on the day we got engaged. It was a great way to celebrate the start of our new life together! It was a great time, though she got pretty bad blisters, and (now that she’s healed up), we’re set to do another one at the end of November. I think it’s a great thing to do with one’s partner. That’s a great story, and a very cool memory Adam (despite the blisters). I absolutely agree with you about it being a great event for couples. As our community here grows, we’ll definitely be doing some things to encourage couples in these types of experiences. My husband is a seasoned runner, just completing his 11th marathon running the Boston marathon this month…I on the other hand am struggling to get healthier and more fit after four children and a busy life with little exercise fit in….but after losing 15 lbs., exercising more than ever and feeling good, I’m ready for the challenge of a 5K and my goal is to complete one either this Summer or Fall and to do it for my husband, I know it would make him proud and the accomplishment would feel great 🙂 I’ve never been a runner but feeling like it’s time to at least try it! A friend shared this site with me recently and I’m loving the info. and already have the 5K training blueprint printed out, ready to start! 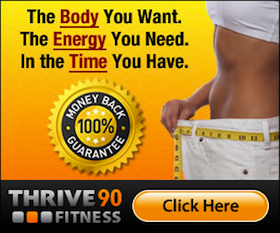 And considering the Thrive90 to do with the hubby! Thanks! If you have any questions about Thrive90 or the 5K plan, please don’t hesitate to contact me. It would be my pleasure to help you reach your goals anyway I can. Hi there. Its nice to hear about your great experience. My fiancee and I are planning on running a 20km race together in a few months and we have begun training. Its our first race, and 20km is further than I have ever run in my life. The training was going really well at first. We started off running 2km together, then got to 4km, then managed to do a 6 km run and finally got all the way up to 9km. It was at that point that my body started adjusting and improving, and my fiancees body started punishing her. This morning our goal was to make it 10km. I was pumped. She was dreading it. From the onset, she got a cramp in her side which put her in a really nasty mood. Let me add right here that she is extremely competitive. Anything I do, she wants to do. She is constantly judging herself against me. So the fact that I did not have side cramps jus upset her more. at about 4km she was really suffering, but wouldn’t stop. Meanwhile, I was all happy and bouncing and was really looking forward to the next 6 km. I told her if she wanted to stop it was fine, but she would have none of it. I ended up forcing us to stop at 8.5km and told her that I had a cramp too (not true…). For me, running has become something that I look forward to. It dramatically reduces my anxiety during the day, increases my workload capacity while at work, and just puts me in a good mood. Today’s experience just made me feel really guilty and bad, and then resentful that I couldn’t do what I wanted to do because of her. On the flip side, she felt awful because I wasn’t having a hard time like she was, and she started hating herself. What a disaster! The same thing happened 2 days ago when we were doing a short run (4km), but less exaggerated because it was a shorter distance. Really, everything had been going so well until these past 2 runs. I tried encouraging her afterwards, but she was just in a total funk. Anyone have an experience like this?? I had never been a runner in my life before starting this training, and I am really learning to love it. But I also love my fiancee and want this to be a joint experience. Thanks for sharing your story. What you’re facing is really very common – we often are in a different place in our fitness level and our ambitions that our spouse/significant other. I know you have the added complexity of a competitive fiance, but you are blessed to have someone who does want to share your active lifestyle. I would suggest that you two plan to run together only on the days when you want to run shorter, more recreational runs. On other days, you can workout separately and/or do something that she really enjoys (especially if it’s something she can beat you at 🙂 ). If you talk openly about it and get all the emotions out on the table, it should go a long way toward setting the right expectations and get your training time back to being enjoyable for both of you. I hope that helps, and let us know how that 20K goes! My husband and I are racing in our first triathlon together this Saturday. We had a practice 5K a few weeks ago and discovered we’d need to be pretty intentional about working as a team this weekend! My husband is much faster than I am, but he’s agreed to serve me and go my pace (SLOW!) I am so looking forward to accomplishing this milestone together! Hope you two had an awesome triathlon together. Sounds like your training paid off and the two of you learned what it means and takes to stick together to complete your goal. Congrates to both of you. My husband and I ran our first race together and his sister signed up with us too. I just finished my first 20K a few months ago, and neither of them have had any training. We ran a 7 mile race with the intentions of crossing the finish line together. When they decided to push ahead of me and finish together it broke my heart. There are pictures of their smiles finishing together–I was supposed to be in that picture. I’m really sorry that you got left out of the finish in your race with your husband. If you haven’t already, I’d suggest you sit down with him and let him know how disapointed that left you. And before your next race, I’d strongly recommend the two of you set some ground rules about how you intend to run the race. As my wife and I continue to run more often, we find it’s really important to decide whether each event is a “stay together” or a “go for it” race where we run as hard as can individually. Once that’s clear up front, there’s no hard feelings or misplaced expectations.